It's hard to maintain an even mix of unboxings and other content on this blog just so each day it doesn't become a boring repetition. The amount of Memeboxes I have coming for me will slowly dwindle down and we can return to other things besides unboxings soon! November is pretty much packed with unboxings and I can imagine December and possibly the beginning of January will be too (wow did this year really go by that fast??). 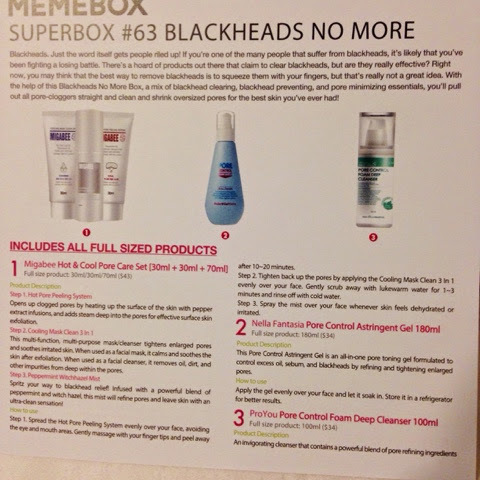 This one is the Superbox #63 Blackheads No More which is a box packed with all things blackhead purging! After the great success of the Free From Oil and Troubles box I was really excited to get my hands on this one and it had everything I thought was missing from the other box so they complimented each other perfectly! I bought this with the Very Berry box so I split the shipping. This box was pricey at $39 + $3.45 shipping for a total cost of $42.45. Blackheads. Just the word itself gets people riled up! If you’re one of the many people that suffer from blackheads, it’s likely that you’ve been fighting a losing battle. There’s a hoard of products out there that claim to clear blackheads, but are they really effective? Right now, you may think that the best way to remove blackheads is to squeeze them with your fingers, but that’s really not a great idea. With the help of this Blackheads No More Box, a mix of blackhead clearing, blackhead preventing, and pore minimizing essentials, you’ll pull out all pore-cloggers straight and clean and shrink oversized pores for the best skin you’ve ever had! This box shipped October 21st and arrived on my doorstep October 22nd. Love the overnight shipping that is express service! I had high hopes for this box and it didn't disappoint! The good thing about getting these unboxings up late though is that I've actually had the chance to use a few things so I can also give a short first impression! This was the spoiler for the box and I'm excited for this whole set. It's a three piece kit that comes with a hot peel (powered by pepper extracts to steam out the gunk in pores), cool mask cleanser (use as a mask to soothe skin post exfoliation or as a cleanser to deep clean the pores), and a peppermint witch hazel mist (spritz on to rehydrated and soothe skin). I'm really getting into facial sprays so that mist is divine and the hot peel is really unique in my skincare arsenal! This is probably my favorite item in the box! I store it in the fridge as suggested and it's the greatest toner to use in the morning both for it's oil fighting properties and the nice wake me up it provides! It's a fast absorbing gel that is nondrying but still effective. This alone is considered a win for me! At first I was a bit peeved about receiving two cleansers in the same box but after reading the info card I realized they were intended to be used one after the other. You start with the cleansing cream which is said to melt away impurities and be deeply hydrating and then you follow up with the foam cleanser. The foam cleanser seems fun, you spread a layer over your skin and way for it to bubble up and then you massage the foam into your skin. 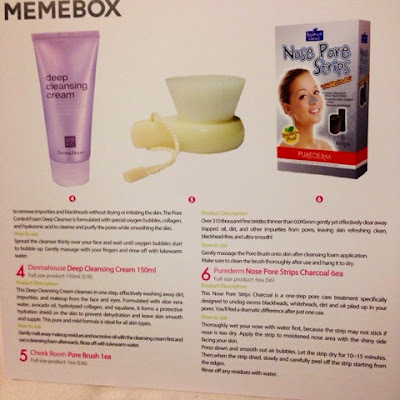 The cleansing cream is ordinary but I think I will have a lot of the fun with the foam! So I literally just bought this exact pore brush (all that's different is the strap) but same shape, look, and bristle density and it definitely only set me back about $3. Regardless this will definitely get used because I love how it feels when used with a cream cleanser. I'll never turn down pore strips and these came at a handy time because I was just running out of the ones I have now! For $42.45 I got about $171 worth of products. Adjusting for the grossly inflated price of that brush though it's more like $140ish. Still it's a decent value and I'm satisfied with the products I got. I am a teensy bit disappointed at the ordinariness of the cream cleanser but who knows maybe using everything together will deliver amazing results in blackhead land!